The Social Skills Groups What is Social Anxiety? Social anxiety can be described as, fear of social situations that involve interaction with other people. It includes the fear and anxiety of being judged and evaluatedby other kids/ young people. If a person usually becomes anxious in social situations, but seems fine when they are alone, then "social anxiety" may be the problem. Socially anxious people have thoughts and fears that are irrational. The person does not realize that their thoughts and feelings are not necessarily true and they get them upset and angry. Their negative automatic thoughts and feelings that occur around social situations make them feel bad. Social anxiety is the third largest psychological problem in the world today. It can be treated, and a person can learn to overcome anxiety and make and keep friends. They can learn to overcome their thoughts and worries and experience JOY in their lives and with their peers. It is these automatic thoughts and feelings that occur around social situations that will best be understood and helped in therapy or in a small and caring Social Skills Group. Usually these anxious feelings are tied to thoughts that are entwined in negative expectations and negative and false self evaluations. According to Louise Hay (author), "what we think about ourselves becomes the truth for us. Every thought we think is creating our future and our lives, the best and the worst. Each one of us creates our experiences by our thoughts and our feelings. The thoughts we think and the words we speak create our experiences. We create situations, and then we give our power away by blaming the other person for our frustration. No, person, no place, and no thing has any power over us, for we are the only thinkers in it. When we create harmony and balance in our minds we will find it in our lives." With your thoughts you can either build or destroy. With your thoughts you can either feel good or feel bad. Everything begins with a thought. You are like a powerful magnet in a sense, and your thoughts whether intentional or not, are attracting experiences into your life. What kind of thoughts are you thinking (is your child thinking) each and every day? Hot Thoughts (Negative thoughts) are things we say to our self to keep us angry. Calling someone a name or saying a Put Down are Hot Thoughts. Putting ourselves down are hot thoughts. How do we feel when we think hot thoughts? Answer: Bad. Cool Thoughts (Positive thoughts) help us cool down inside. Cool Thoughts are words and phrases that help take us away from anger and feeling bad. How do we feel when we think cool thoughts? Answer: Good. For practice, give examples of hot thoughts you or your child may have and change them into cool thoughts. Example: Hot Thought: I was not invited to a certain person's house because they do not like me. Cool Thought: I will call another friend and make different plans. Moral to the lesson, focus on what you want and not on what upsets you and what you do not want in your life. Remember that you are a creative individual and that what you think about you bring about. If you want something to come to pass in your life, first you must think of it. Think of it intentionally, and keep your focus on it. Do not keep your focus on what you do not want, because in the same way... you will get that too. The more emotion (feelings) you have in the thought, the quicker it will come to you. So do not put your emotion in a bad thought for that will also come to you, even if you do not want it. You have a right to live a happy and contented life. This begins with intentionally choosing cool thoughts. 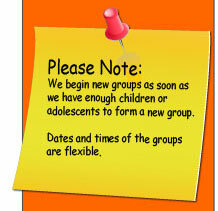 Participate in a Social Skills Group each week. It will offer support and a place to work on new and healthy skills. Allow the child/young person to observe several other kids before attempting a skill. Plan for (at camp and at school) the child to sit among, be with, familiar or preferred classmates or camp friends. Use a calm, quiet voice to reduce the child's/young person's anxiety. Specify time to discuss/address recognized fears and worries outside social situations, which should include sharing his/her feelings with a specified adult and/or peer in a structured setting (Social Skills Group) at the same time every week. Parents who have or had Social Anxiety get the help for yourselves and do not pass these ideas, ways, and worries on to your children. Additionally, help the child set up play dates and express confidence in their abilities and in their future.